Are you thinking of visiting Walt Disney World next month? You’d better keep your selfie stick at home. Disney World is banning selfie sticks from its theme parks as they have become “a growing safety concern” for both its guests and cast, Disney World spokeswoman Kim Prunty said Friday morning. After June 30 selfie sticks will no longer be allowed in any of Walt Disney World’s four Florida parks and two Disneyland parks, California and DisneyQuest Indoor Interactive, Orlando. The sticks will be banned from Disneyland in Paris and Hong Kong on July 1. Disney hotels and resorts will still allow the selfie devices. The ban was preceded by several incidents, although officials have been discussing the change for some time. Just this week at Disney California Adventure park, a roller coaster was stopped mid-ride for more than an hour, after a passenger pulled out a selfie stick at the ride’s highest point. Passengers had to be evacuated from the ride. 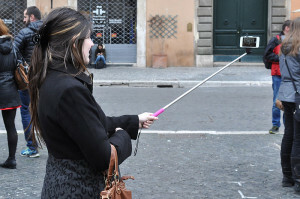 Disney joins a growing number of venues around the world banning selfie sticks, citing safety hazards or view obstructions: the New York’s Metropolitan Museum of Art, the National Gallery of Art in Washington, the Art Institute of Chicago, the Getty Center in Los Angeles, London’s National Gallery, English Premier League soccer stadiums, the Kentucky Derby, Brazilian soccer stadiums, the Wimbledon tennis championships, and many film and music festivals all over the world. If you are trying to get the angle just right to create an artful self-portrait with that famous Cinderella Castle at Magic Kingdom, and then to post the picture to social media sites, such as Facebook or Twitter, you will have to do it the old-fashioned way, with your arm.